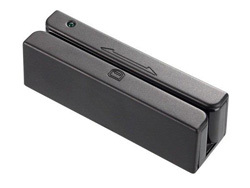 MTMSR is an ideal magnetic stripe card reader device by M-Tech Innovations. The device provides wide range of functionality and value in a convenient package size. M-Tech has been manufacturing high-quality magnetic stripe card readers that are used in various industries and organizations. This user friendly plug & play magnetic stripe card reader is completely programmable and so is high-demand in several industries and organizations. The seamless functionality of the magnetic stripe card reader allows programming and configuration of data format and intelligent interface output so as to match precise application and communication requirements. M-Tech Innovations, being the leader in providing smart card solutions is enabled with high research and development facilities in its unit at Pune, India. Our magnetic stripe card reader products are preferred by various organizations like banks, financial institutions, organizations along with sensitive industries. We have been associated with several governmental and private sector establishments where magnetic stripe card readers have become an essential part of day-to-day operational processes. Using magnetic stripe card readers not only enhances the data security and security of sensitive information but also eliminates the possibility of human errors. Magnetic stripe card reader proves a perfect solution to many security hassles and ensures flawless operations for the organization.